Chronon: Sorry, I’m returning to college soon so I had to take some days off to do coursework and homework as well as actual work. There are some mistakes in the latter half of this chapter due to tiredness. The Imperial army had withdrawn after suffering enormous damage. So Kazuya had began searching for the three missing people. He at least shouldn’t be a prisoner of war. The two soldiers he was looking for had become corpses. Only Sergeant Funasaka, who went looking for them, couldn’t be found. Though he was worried about the Sergeants safety, Kazuya made the decision to end the search. Kazuya went back to the castle, where Maria was waiting. After hearing that, Kazuya set off to find Karen. After finding out that Kazuya was safe, Karen floated a smile that could even make flowers bloom. However, upon seeing Kazuya’s facial expression on top of his voice, she felt her chest tighten. Kazuya asked Karen that question in order to change the subject. After having a dark conversation about the future, Kazuya left the room along with Karen. Chitose had been waiting for Kazuya in the corner of the castle, where a tent had been set up to act as a command centre. Kazuya eyed the paper handed to him by Chitose. Looking at Kazuya frowning as he read the report, Chitose called out timidly. The difference in firepower is no longer in our favour…. But….if I use those reinforcements, we won’t be able to use the excuse of being ordinary adventurers any more. Most people would be suspicious if such powerful modern weapons are used. …..it also seems as if somebody is just waiting for us to show our full power. Chitose seems to be lost in though as Kazuya broods. Kazuya eventually decided to ask for additional fire power from the outpost. On the next morning, everyone was anxiously anticipating a large scale magic attack by the enemy like the day before. Before the sun had even risen, the soldiers were preparing for combat. But the attack that everyone was anticipating never occurred. The attack from before seemed to have just been a warning. Furthermore, there seemed to be no movement from the enemies camp. It seemed as if the day would pass peacefully like this. KANG! KANG! the sound of the bell that informs the fort city of an emergency situation sounded. Kazuya who had heard the bell, asks Chitose to get in touch with the soldiers on lookout via radio. To verify the report, Kazuya climbed to the top of the ramparts. What Kazuya saw, was a large floating island covered in cannons. There were also big, small, thin, fat ships floating in the air either side of it. Oh…it really does seem like an air fortress. As Kazuya thought as much. Karen adorned in shining armor, grabbed Maria hastily at the side of him. Karen said so whilst looking at Kazuya as if coming up with some type of pathetic resolution. As Karen said so, she turned her sight to the large fortress in the sky. Suddenly a man’s face appeared projected from the fortress. He had silver hair and odd eyes. Hey, has something started now? Due to the guys speech, everyone present was looking up at the man who calls himself Gohon. Listening the the man’s speech, Kazuya spoke to Chitose in a low voice. A small explosive sound was suddenly heard as Kazuya was listening to Chitose. Looking at the source of the sound, Black smoke was rising from the enemies headquarters. Chitose said to Kazuya as she observed the enemies putting out the fire, using her binoculars. In the face of the overwhelming pressure of the Imperial troops, Kazuya had not considered surrendering. Regardless, she grabbed Kazuya by the neck, drawing in close whilst blushing red. Kazuya glanced at Chitose, telling her to holster her Beretta, whilst he stared into the eyes of Karen. Kazuya murmured as he undid the hand grasping his neck. He then grabbed his walkie talkie. Ten seconds later, some thin, long objects appeared in the sky above the fort city one after another. Karen was shocked, but this was understandable. What was flying above the fort city was a squad of F-22 Raptors as well as a barrage of AIM-120 BVRAAM air to air missiles. The ships they were aiming at could not avoid the missiles, due to their speed reaching Mach 4. The sound of explosions filled the air as the missiles ate away at the ships, blowing their wings off. Some of the missiles also hit the flying fortress, however they did little to no damage due to the powerful magic shield protecting it. Karen somehow managed to squeeze out her voice as she watched in shock and awe as ship after ship was reduced to a falling fireball. Kazuya said so, laughing like a mischievous boy who had succeeded in a prank. On the other hand, the fortress was in chaos to have suddenly received that missile attack. As the damage reports come rolling in, the man pleads for a ruling on what to do. Renya didn’t hear his subordinates pleading an began to make noise on his own. Whilst wasting time, many missiles hit the barrier. The fortress quivered due to the impact. Waking from his stupor, Renya’s face grows red as he gets angry. Although the subordinate took the verbal abuse to heart, he followed the order regardless. The magic barrier was deactivated as expected, many missiles approached the defenceless fortress. It was not possible to deal fatal damage, as these were air to air missiles and their target was a land fortress floating in the air. However, one of the missiles landed close to the command room where Renya and the others are. Blowing the wall off. Renya was somehow intact, however he saw the severed arm of one of his men and instantly backed away from it. Without being able to disobey, the badly bruised soldier made the fortress withdraw. The fleet that was giving off an overwhelming pressure a few short moments ago, was almost completely destroyed. The Imperial army went dumb in surprise upon seeing this. On the orders of the lieutenant commander, the planes drop to an altitude of 200 metres. The planes simultaneously dropped around 198 cluster bombs on the imperial headquarters in a stunning, precise formation. Thousands of child bombs explode at the same time, mercilessly decimating the imperial camp. The air unit which had decimated the enemy, once again returned above the imperial camp. They flew down to an even lower altitude and opened fire, whilst in formation. When the trigger is pulled, 7 tubes of the 30mm GAU-8 gatling gun revolve at a high speed. Bullets are shot out so fast, it is as if the plane itself is breathing fire. 4,200 rotations per minute of armour piercing incendiary rounds fired into the enemy troops, turning them into cinders. After a short 10 second assault, the planes returned back to base. Leaving behind long burn marks on the ground, as well as a vast sea of blood. Whilst listening to the reports one after another, Kazuya was gazing at the air corps flying in formation above the city. Karen asked Kazuya after witnessing flying machines that flew faster than possible in this world. As well as them decimating the powerful imperial army as if they were ants. It was difficult to hide her surprise. The voice of Karen is ignored as Kazuya walks to the command post, surrounded by well equipped soldiers. The shooter and the pilot within the AH-64D Apache longbow that was dancing in the air above the fort city, received the orders from Kazuya. They currently had complete air superiority, the dragon riders were all dead and the enemy fleet had retreated. At these words, a merciless rain of M230A1 30mm machine gun bullets and 70mm rockets was fired at the imperial troops who had already lost their fighting spirit. After that, the Imperial army who had boasted about their numbers of around 600,000 troops, was reduced to around 300,000 from the attack by Kazuya. 100,000 of them surrendered to the canary kingdom and 200,000 of them ran back to their homeland. Lol is there a chapter tomorrow? So summoned soldiers have a wicked sense of humor eh? … they’re playing Flight of the Valkyries, aren’t they? Ride of the Valkyries by Richard Wagner is famous in helicopter warfare on movies and shows. The standard song to play under any helicopter and /or gunship assault, is Wagner’s ‘Ride of the Valkyries’. Apocalypse Now had it, Gate had it, maybe something else had it, and now this has it. Apocalypse Now started the trend. It also has an ironic meaning to it because the seemingly triumphant ride of the Valkyries ends in defeat. A very fitting song for the movie I’d say. you forgot to TL 10.5 that tells where Funasaka ended up and what the explotion at the base means. Damn, was 10.5 relevant to the story? I thought it was a side story…. show funasaka’s personality, says what happened to him when Kazuya went to rescue them, and in chapter 12 there’s more information, so it’s kinda relevant. So that other worlder managed to get away. Oh well, live and fear the MC and his mighty military. Question that comes to mind is, where is the other woman soldier that was with him. It’s an apache. Assume it’s flight of the Valkyries. I thought he can only use ww2 equipment? Did the restraint had been released? You mean during defend at the abandoned fort? I think so. It might have been after that, he upgraded his bases afterwards. I guess I miss some chapters need to go reread..
Yeah, all other worlders have cheat abilities, but it depends on what they choose. I could choose to be forever young, but it wouldn’t help me in a fight. We don’t really know what powers that other guy chose. The other worlders in the beginning chose things like magic and were pretty OP. We can expect something similar in the future I think. Also, Kazuya got 3 cheat abilities since he was killed 50 years before his time. Some of these otherworlders probably on have 1 cheat. Also the cheat they seemed to have chosen is for personal power where Kazuya chose more of the General/leader types powers. I wonder the mc’s tech base can progress past 2016? The flying island was a surprise. Our MC has not yet set up a scenario where he blows up a fortress in the sky. He’ll find the appropriate method of dealing with it, now that he knows such an enemy exists. He’ll probably use offshore cruise missiles when the time comes. Is nobody going to comment that the F-22 Raptors somehow had GAU-8 Gatling guns? They have M61A2 20-mm cannons, the GAU-8 is on the Thunderbolt and it so big, they pretty much built a plane ‘around’ it. F-22’s didn’t have the GAU-8. They were sent in to fire the air to air missiles at the fleet. 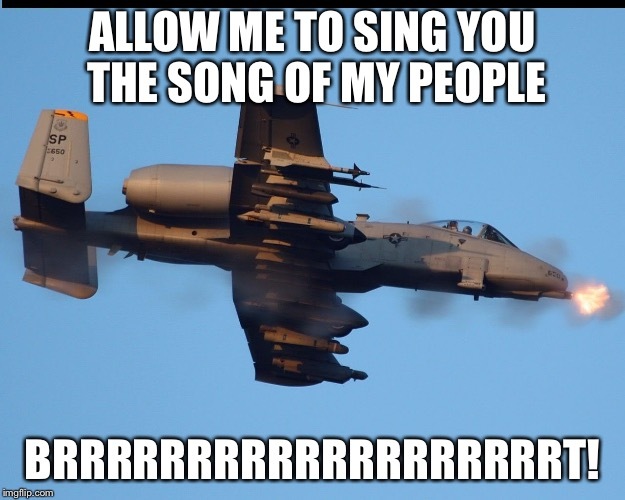 Then the A-10’s came in with the GAU-8 and cluster bombs for the ground troops. Thanks for the chapter Chronon! Good luck with college coursework! A complete air airstrike scene is never complete without Wagner’s Flight of the Valkyries playing in thr background. I’d rather play AC/DC Shoot to thrill. This is like gate’s battle of italica,but the air battle ver. In the next chapter Kazuya will be level-up again. I would like him to summon an aircraft carrier USS Gerald R. Ford that launched on November 2013 and USS Zumwalt a guided missile destroyer that launched on October 2013. Frankly I’m hoping they played Yakety Sax or some other light hearted tune while they were busy slaughtering. The AIM-120 missiles are called AMRAAMs. They are BVRaam but no one actually calls them that. BVRAAM refers really to any long range missile air to air missile. helicopter pilots really have a hard on for flight of the valkyries huh? A web novel about guns and armor vehicles daym~ i got totally hooked! Thanks for the chapter…. did he manage to bring down the fortress with the otherworlder or did he let him escape? Nice story. Thanks for the work. Damn… I can hear the ride of valkyries, is it? Or am i just hallucinating? Raptors? Even gate use only phantom. That is supercheat!!! 18 A10 thunderbolt II’s flew into the field equipped with CBU-87/B cluster bombs. Gah why’d he use cluster munitions. Those things have an absolutely atrocious failure rate resulting in thousands of potential mines in that area. There is a reason that the convention of Geneva prohibits the use of those (good thing Kazuya is not a signatory, next time let him use Sarin). The song is definitely “It Ain’t Me” by CCR. This chap is the best. Wow, so overkill. What happen to renya?.